St. George Island, Alaska, (population 100) is the second largest of the five Pribilof Islands located in the Bering Sea, 300 miles west of the Alaskan coast. The islands were known to the indigenous people of the Aleutian Islands through legends about their discovery long before the arrival of the Russians in 1786. The vessel St. Georgii, captained by Gavriil Pribylov and carrying fur traders in search of the legendary fur islands, landed here, and the island became a Russian colony. Pribylov brought in Unangan people (Native Alaskans also known as Aleuts) from the Aleutian Chain to work harvesting the abundant fur seals: killing, skinning, and curing the pelts. The lucrative fur seal colonies on St. George and St. Paul Islands are considered a primary reason for the United States’ purchase of Alaska in 1867. At the height of the U.S. government-run commercial fur seal industry, the population of St. George reached more than 300. Since the end of commercial sealing on St. George in 1972, the population, comprising mostly Unangans, has decreased significantly. The cessation of the commercial seal harvest and the general decline in Bering Sea fisheries has left the community of St. George struggling to maintain an economy and looking to tourism and research to help sustain the village. The St. George Sealing Plant was restored in 2000 and is part of the Seal Islands National Historic Landmark. Interpretive tours are provided of the fur seal harvest plant, where visitors can learn about the history and manufacturing process. This sealing plant provides the only remaining facility in the world where the fur sealing process can be re-visited. Plans are to turn the plant into a cultural center, museum, and gift shop. 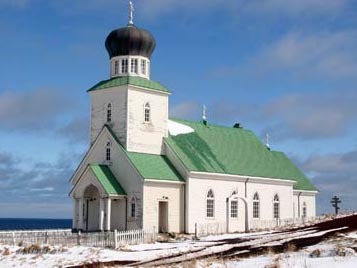 Other historic structures on the island include St. George the Great Martyr Church, constructed in 1936, which contains many significant objects dating back to the previous 1845 church. The St. George Hotel, built in 1930 to house visiting officials, was refurbished in 1999, and is also part of the National Historic Landmark. Spectacular scenery, wildflowers, and wildlife are attracting an increasing number of tourists to St. George. The Pribilof Islands provide seasonal homes for approximately 2.8 million birds representing more than 200 different species. Bird watching is a popular activity for visitors. Other recreational opportunities include seal watching, kayaking, fishing, hunting, and hiking.